Twitter now lets you promote your profile for $99 a month, but is it worth it? Over the past few months, Twitter has been quietly experimenting with a service that lets users promote itself for a flat fee of $99 per month, called Twitter Promote Mode. If you’re a brand new to Twitter, or an aspiring influencer (gag), this will let help you build an audience — at least, in theory. Promote Mode — which weirdly is mobile first, and can only be accessed through the Twitter app — promotes your tweets and profile without the effort of actually building your own campaign. It’s all automated. You’ve got to bring the content, which happens by virtue of using Twitter, and the microblogging service will put it in front of more eyeballs. In a press release, Twitter talked about what punters can expect. 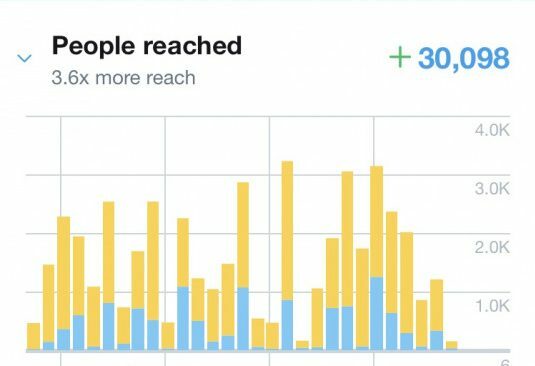 One Promote Mode user, @RIMtailing, gained over 30 new followers and made 30,000 more impressions. Overall, it seems to be aimed at individual users and small-to-medium businesses, rather than large corporate behemoths, who have the staff and funds to build more expansive Twitter marketing campaigns. Those unimpressive figures sound about right. Our social media head, Matt Navarra, has been using it since October 31, and so far has gained an extra seven (seven!) followers, and just slightly more than 12,000 impressions. This tweet speaks for itself, but suffice to say he isn’t impressed, and is unlikely to maintain the $99 subscription. Promote Mode also comes with a suite of analytics tools. This actually looks pretty useful, and distinctly shows organic engagement as being separate from that you’ve paid for. It’s not all that surprising Twitter released this tool. Firstly, with growth sluggish, the company is under a lot of pressure to pad its bottom line. I also imagine there’ll be a lot of demand for this service, even if the results it produces are mixed. In most industries, Twitter is increasingly regarded as an essential part of a personal brand, and the more followers you have, the more credibility you are perceived to have. Promote Mode may be seen as the rocket fuel to make that happen. If you’re tempted to give it a spin, Promote Mode is available from today in the UK and US. The company also plans to expand it to Japan in “the near future,” but doesn’t have any concrete date to share at this moment.